My visit to Con Dao brought me an unforgettable experience of discovering beautiful landscapes and especially savoring hat bang(tropical almond’s seed), the locality’s specialty for the first time in my life. 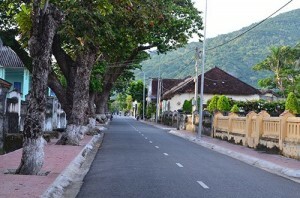 A popular image of Con Dao is of huge bang trees (tropical almond) lining on the street, in the garden and of course the infamous Con Dao prison. Especially, there are lots of ancient bang trees that were planted over a century ago, they are special as they can adapt to harsh weather. During the autumn, tourists will find a spectacular view of red leaves flying in the air and rustling on the ground like a whisper. Old islanders insist that soldiers who were exiled to the island during the revolution wars were unsure of the time of year, so they watched a bang shed its leaves to learn the season. They hid the leaves in their person to the detention room to protect themselves from cold weather or wrote poems and letters to each other on the leaves. Others ate green leaves or ripe bang fruit to fight hunger. After reunification, many war veterans chose to stay on the island and work and since then bang seeds have been known as the specialty of Con Dao. The tree blossoms and bears fruit all-year-round but tourists can find ripe fruit falling from trees from July to August. Local people will dry the fruit from 10 to 15 days then take the seed. Each fruit has only one seed so it takes much effort to collect a kilogram which is priced from VND200,000 to VND250,000. Next the seed is roasted with salt after being dried or soaked with sugar for a sweet flavor. Those on their first visit to Con Dao will remember the greasy and sweet taste of this seed and carry lots of bottles as souvenirs for their relatives on the mainland. Con Dao is 180km from Vung Tau City. You can reach the island by sea or air which is the most popular. Tourists are advised to take a 45-minute flight of Vasco or Airmekong priced from VND2.1 million for a two-way ticket from Tan Son Nhat Airport in HCMC to Co Ong Airport on Con Dao island. Popular transport on the island is xe om (motorbike taxi) or tourists can rent a motorbike from VND120,000 to VND150,000 per day or a car at VND800,000. Tourists should check the petrol tank in advance as there’s only one gas station on the island. The best time to discover Con Dao is during March-September where the sea is peaceful with some early rain. Recommended activities on the island are diving on Hon Tre Island, trekking at Ong Dung Forest, admiring sunset at Bai Nhat (Nhat beach), swimming at Dat Doc, Lo Voi and Dam Trau beaches and watching turtles giving birth from June to September on Bay Canh Islet.